Uncle Herman with some words of advice..
HARVARD, Nebr. 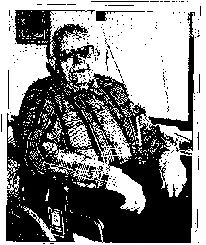 - "Early to bed, early to rise, hard work makes you wise," is the motto of Harvard Rest Haven resident Herman Brehm. And Brehm, who turns 100 today, has followed that saying. He said he has enjoyed his life's work - farming - for most of his 100 years. A celebration is planned in his honor 24 p.m. Sunday at Harvard Rest Haven. "I can't believe that many years went by," he said. "I just lived a clean life!' Brehm said he never smoked or drank alcoholic beverages and tried to eat healthy, which he recommends to others. At Herman's side as he celebrates 100 years is his high school sweetheart, Alice, 97 They will celebrate their 77th wedding anniversary April 14. They are lifetime members of the United Methodist Church in Harvard. The Brehms have one son, Russell of Colorado; one daughter, Rosemary of California; three grandchildren and three great-grandchildren. The couple is a recent addition to the rest home. Mrs. Brehm arrived in October 1996. Brehm joined her just after Christmas. An avid sports fan, Brehm said he also enjoys playing cards. However, some people in the rest home are "too old to play me," he said. Herman has spent all 100 years living in Clay County. Born March 13, 1897, he grew up on a farm with six other boys and four girls, all of whom lived to a mature age, he said. He and his siblings saw farming techniques evolve from horses and mules to tractors. He started with horse power for a few years then wound up with mules He once traded six mules for a tractor. "That old thing did what it was made for - cheap transportation," he said.